“Actions speak louder than words,” people used to say. But that’s so 20th century. The modern American ethos seems to value how you feel far more than what you do. 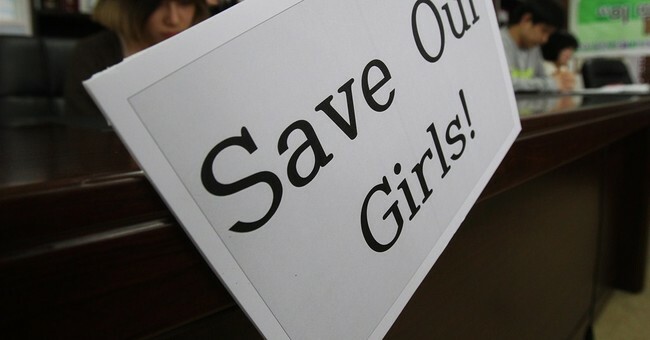 Last month, almost 300 girls were kidnapped in Nigeria by the terrorist group Boko Haram. Its leader insists they’ll be sold into slavery; some may have been already. Western leaders have left no doubt they feel bad about all this. Michelle Obama’s pouty-faced photo on Twitter went viral. She’s holding a hand-lettered sign: “#BringBackOurGirls.” British Prime Minister David Cameron also held such a sign on the BBC. Yet the Western military response has been something less than robust. “A White House spokesman said that experts in intelligence, hostage negotiation and victim assistance would fly to Nigeria,” The Economist reports. “The British offered to send surveillance aircraft along with soldiers from its special forces.” Our outraged attitudes don’t seem to align with our actions. No doubt Twitter, with its 140-character limit, isn’t the best place to conduct diplomacy. But it’s an excellent place to advertise that you care about something. In March, U.S. State Department spokesperson Jen Psaki waded into the geopolitical debate via social media. She tweeted a photo of herself smiling, giving the thumbs up and holding a #UnitedForUkraine sign. “Russian leader Vladmir Putin sent in troops and tanks to invade neighboring Ukraine and the Obama administration is coming to the rescue with .?.?. selfies!” quipped the New York Post. When the Russians responded with derision, tweeting out their own #unitedforukraine, Psaki responded that she hoped they would “live by the promise of hashtag.” Meanwhile, her boss was making it clear there would be no military consequences if the Russians failed to do so. “Why is it that everybody is so eager to use military force?” Barack Obama wondered in the Philippines. It’s unclear exactly who “everybody” is. Maybe a rogue tweeter? Anyway, Obama warns against force, noting:“we’ve just gone through a decade of war at enormous cost to our troops and to our budget.” A concise statement that would have fit nicely in 140 characters. This attitude isn’t limited to politics, of course. It also crops up in economics, where “income inequality” is all the rage. Obama calls it “the defining challenge of our time.” Progressives have fallen in love with a French economist named Thomas Piketty, whose book “Capital in the Twenty-First Century” calls for massive taxes on wealth holders. “Piketty urges an 80 percent tax rate on incomes starting at ‘$500,000 or $1 million,’” Daniel Shuchman wrote in his Wall Street Journal review of the book. “This is not to raise money for education or to increase unemployment benefits. Quite the contrary, he does not expect such a tax to bring in much revenue, because its purpose is simply ‘to put an end to such incomes.’” The point isn’t to help the poor as much as it is to help everyone feel better. Feeling, rather than doing, even extends to presidential politics these days. Every candidate makes big promises on the trail that will never be kept once in office. Obama assured us he would cut the budget deficit in half by the end of his first term. Instead, because borrowing is easier than trimming spending, he ushered in the era of annual $1 trillion deficits. To avoid the inevitable disappointment, then, Tina Brown is urging Hillary Clinton to skip the campaign process entirely and instead deem herself a post-president. “The post-presidency, as Jimmy Carter and Bill Clinton have proved, is a win-win,” Brown writes. “Money, Nobels, the ability to leverage your global celebrity for any cause or hobbyhorse you wish, plus freedom to grab the mike whenever the urge takes you without any terminal repercussions.” Indeed, it must be nice to be a post-president. The reason most of will never know exactly how nice is because so vanishingly few of us will ever be elected president. Brown insists Mrs. Clinton would be better off to simply, “leave the presidency to the people who don’t know what she knows all too well: what it’s really like.” No doubt everyone could feel better if that happened. And isn’t that what life’s all about?